SmithTaylor can make Custom Coasters from your photographs, illustrations, paintings, etc. All you have to do is send us a high resolution image in JPG, TIFF or PDF format and we'll do the rest. 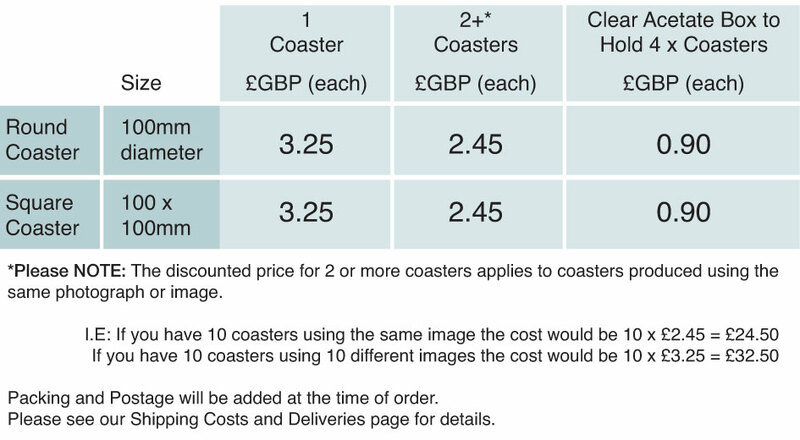 For guidance there are some Coaster Templates to download to show you the printing areas, how we require the artwork and general hints and tips. We'll get back to with a print proof to approve before we produce the final coasters and arrange to take your payment.